Women's Unique Designer Silver Pendant : LOVE2HAVE in the UK! A women's unique designer silver pendant. 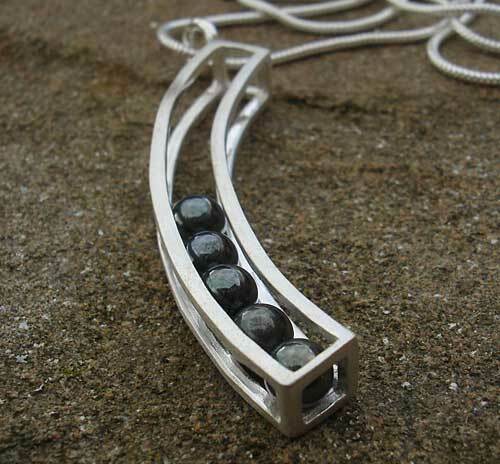 Our silver rolling spheres ladies necklaces are one of the most unusual and unique jewellery designs on our website. All the pieces consist of a handmade matt finish silver cage-like construction designed to house moving spheres securely enough, so they don't fall out, but freely enough so that they move and roll within the structure. We would describe this as a fun piece of jewellery. 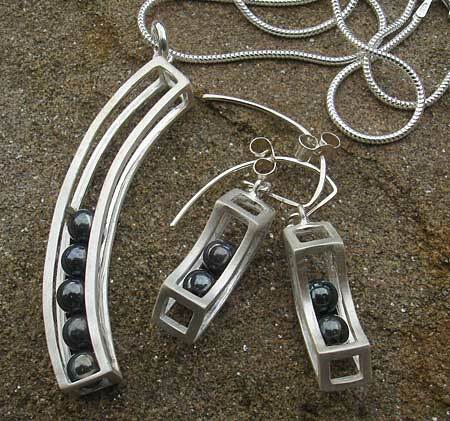 They are all painstakingly made by hand from silver precisely enough with the aforementioned in mind. This particular piece has a curved cage styling with squared ends that measures approximately 45mm in height. Inside the cage sit five black steel balls that as described roll freely in a handcrafted silver cage. The silver cage comes with an eyelet at its top threaded onto a 16-inch silver snake chain with a lobster clasp. Pictured also are matching earrings.